This week we’re excited to be interviewing The Him, a rising DJ & music production duo hailing from Amsterdam. 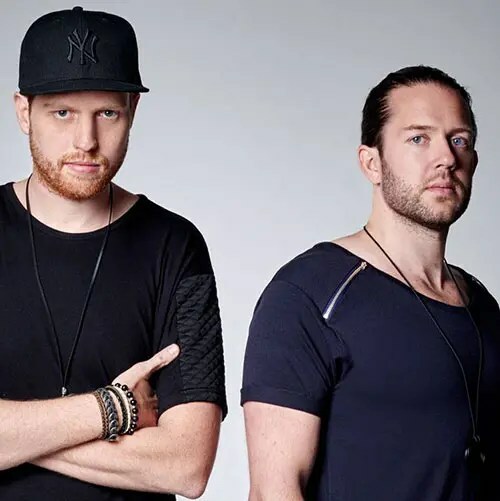 Jeroen Kerstens and Steven Berghuijs are most notably known for their hit singles, official remixes and their Midnight Mixtapes on SoundCloud. Their track “Feels Like Home” continues to make waves across Spotify, SoundCloud & Hypem with over 30 million plays combined. Your music style has been described as a mixture of deep house, pop & nu-disco. What three songs would you recommend to someone listening to your music for the first time? How did you both meet and discover you should be creating music together? We met backstage at a festival a few years ago. At that time we were both involved in the Amsterdam techno scene. We started talking about pop music and decided to meet once a week in the studio. Working on some bootlegs and mashups and our first remix competition on Beatport was a big success. One day became 2 days and after a while it evolved to a full time project. Your track “Feels Like Home” blew up in 2016 with over 30 million plays to date. Why do you think it was so well received? Its a song about going away and still feeling at home. That’s something a lot of people go experience, being in traveling, moving or life changing situations. The overall track still feels uplifting, and also works great on the dancefloor. It’s always hard to know for us why something works, but that would be our guess! Most of your songs have a warm melodic feel. Can fans expect melodic mixes from your live sets as well? Yeah of course. We always try to make a unique set. We play a lot of different genres in our set and a lot of melodic mashups with sick drops. This will keep it fresh and try to give a set that nobody has heard before. Follow-up question: What can fans expect from your live set at Lavo? First of all, thanks for having us back! We always start with some warm and melodic tracks. But we like to mix it up during our set. We play loads of our remixes and special edits. We have different energy levels to keep the party going and going so you should expect a crazy good time! Where did you draw inspiration for your latest track “I Wonder” ft LissA? The initial idea for the song started with a personal story from LissA which became more about a situation in which you have to part ways with somebody but still wonder if they still sometimes think about you. The track went through a couple of different stages and was pretty experimental for us. The vocal chop on the drop sounded too weird at first to work and the chords were actually accidentally shifted to make the groove as it is now. But we just love the quirkiness that gave. Any plans while you’re in NYC? New York feels like home. We did some sightseeing in New York the first 4 days of this year. We will have different writing sessions and will work on new music during our stay this time. We’re happy to spend some time with our team and extended family on this side of the pond and as we are big foody’s we’ll enjoy some of the amazing places NY has to offer! What artists are you both listening to right now? Amsterdam is known for their craft brews. What do you find yourself drinking at the bar? Steven: I love all the IPA beers. During dinner I like a good red wine. We are touring the US, Mexico and Canada the next 2 months. Really excited about it. We have tons of new music ready and can’t wait to show it to you. For those following you in real-time. Can fans find you on Snapchat or Instagram? @thehimofficial to follow our adventures!